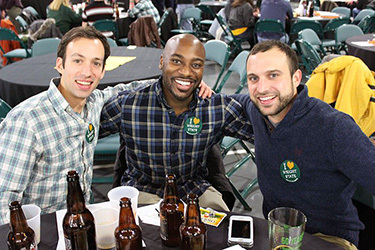 If you are interested in planning an affinity reunion, the Alumni Association will work with you and your committee to provide the support and tools necessary to make for a successful event. Affinity reunions are a great way to get together with classmates and colleagues. An affinity group is a group of people with like-minded interests that may not be of the same graduating class. Greek organizations, student organizations, athletic groups, and groups based on majors or careers are examples of affinity groups. A number of affinity groups have formed alumni societies to support sustained activity in support of and with the university. A reunion committee of at least 4 members should be established to assist with planning reunion events and to recruit fellow classmates to attend them. The length of commitment by committee members depends on when reunion events take place, but it is recommended that members commit to the full planning process which should range anywhere from 6 months to one year out from the reunion date. Advisory Services: A staff member is assigned to serve in an advisory capacity for reunion events. As the reunion host, you will have at least one staff member assigned to work with you. Budget: All affinity reunions are planned as zero budget events. Your staff liaison will help to build a budget for your reunion activities and work with you to establish a price point for reunion participation. Mailers: Save-the-date reminders or invitations with all necessary information will go out to prospective attendees for your reunion. Reunion committee volunteers will need to work with your staff liaison to provide the information for the invitation and to proofread it before mailing. Online Registration: Your affinity group will have a reunion registration site with details about the event and a list of committee members. Email Blasts: A save-the-date email invitation and reminder emails will be prepared and sent on your behalf to our online alumni community. Supplies: We will provide you with name tags for guests, Wright State Alumni Association information, and some giveaway items for your reunion. Reunion Program: For your opening event, the Association will provide talking points that contain campus updates. Our office can also help arrange special guest speakers for your event. Alumni Staff Responsibilities: The Alumni Relations Office is responsible for approving venue locations, vendors, and deposits, and will sign all contracts as well as collect all registrations. If you are interested in planning a class or affinity reunion, please contact us at alumni@wright.edu or (937) 775-2620.